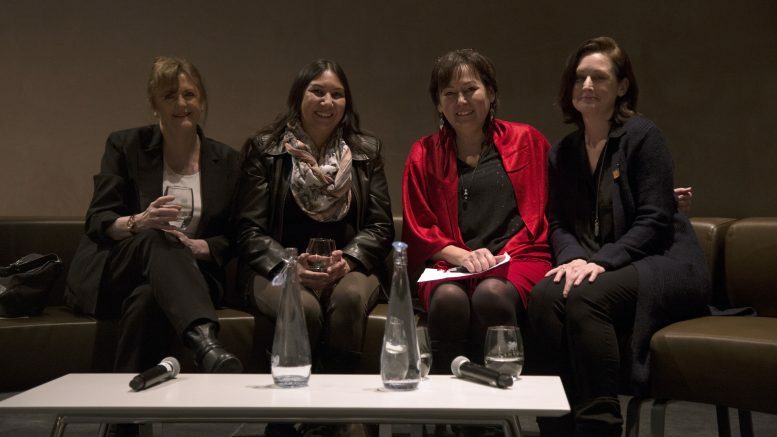 The screening of “Us and Them” was followed by a panel discussion with guest speakers (left to right) Jane Meagher, Althea Guiboche, Sandra DeLaronde, & Kristy Loughton. 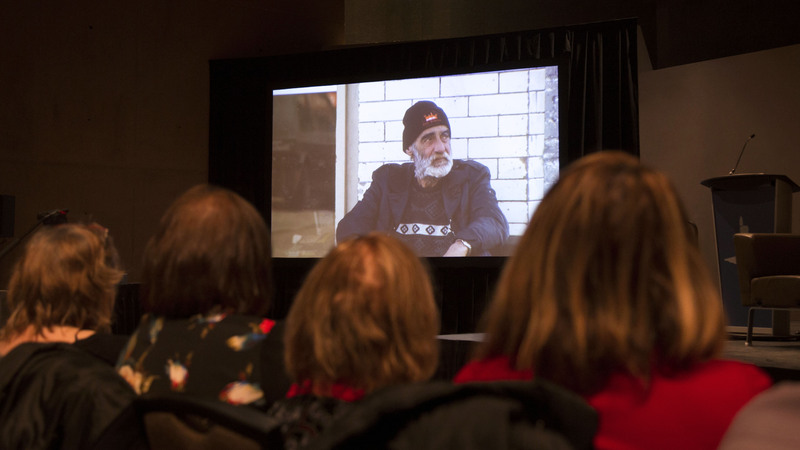 A documentary highlighting the lived experiences of four chronically homeless people in British Columbia was screened at the Canadian Museum for Human Rights March 8. Directed, produced, and written by Krista Loughton the documentary, titled Us and Them links homelessness and addictions with the issue of missing and murdered Indigenous women and girls (MMIWG). “We are really trying to correlate the issues of homelessness and addictions with the MMIWG,” Loughton said. “A lot of people talk about housing first, which is a system where you put people in a unit regardless of if they are using [substances] or not,” which Loughton said should be coupled with extra support services. “If we had these services in place, where there was housing and Indigenous-run housing with Indigenous-run cultural supports for people, that would prevent a lot of the women that are at risk out there that are generally speaking are from a low socioeconomic bracket,” she said. “Us and Them is a deeply visceral film that shows audiences the reality of life outside on our streets,” she said. The film spans over a period of more than a decade, which Loughton said honestly presents the stories of four individuals along with destroying some of the stereotypes about homeless people. Loughton said that even though she lives in a gentrified area of Vancouver, she did not understand the extent of the issue of homelessness until she started working on the documentary. The documentary film, “Us and Them” was screened at the Canadian Museum for Human Rights on March 8th. Loughton said it was a special event to screen the film on International Women’s Day (IWD), March 8, a day celebrated around the world to recognize the achievements and struggles of women. MaryAnn Mihychuk, member of parliament for Kildonan–St. Paul, attended the screening. 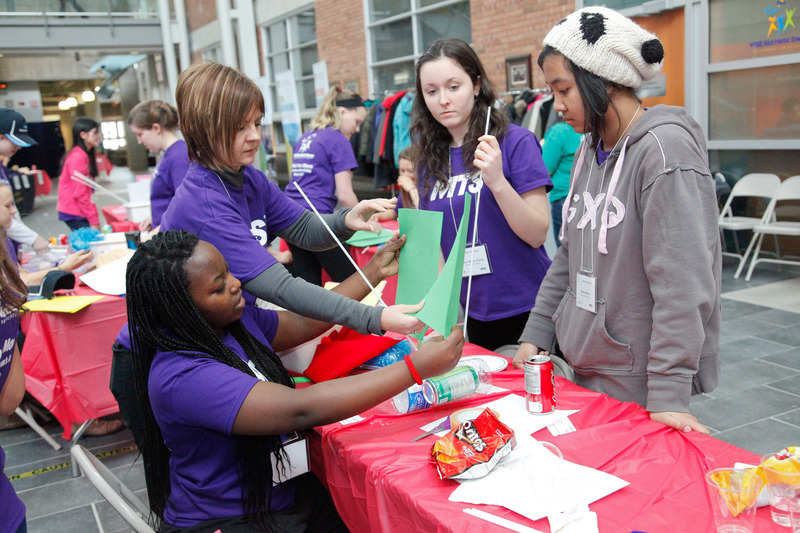 “It’s been [an] especially happy and robust and active [IWD], much more active than last year or years before and I think that it is truly a celebration and time for us to really make the change we have all hoped for,” she said, adding that Indigenous women face unique challenges and difficulties. The screening was followed by a panel discussion emceed by Ry Moran, director of the National Centre for Truth and Reconciliation. The panelists included Loughton, Sandra DeLaronde, co-chair Coalition for MMWIG, Althea Guiboche, of Got Bannock, and Jane Meagher, former director of Red Road Lodge. The federal government launched a national inquiry into MMIWG in 2015. Since the inquiry’s launch, numerous staff members, commissioners, and researchers have resigned. Families of MMIWG have criticised the inquiry for not keeping them at the heart and centre of the hearings. Marion Buller, the chief commissioner of the national inquiry, asked the federal government for a two-year extension last week. 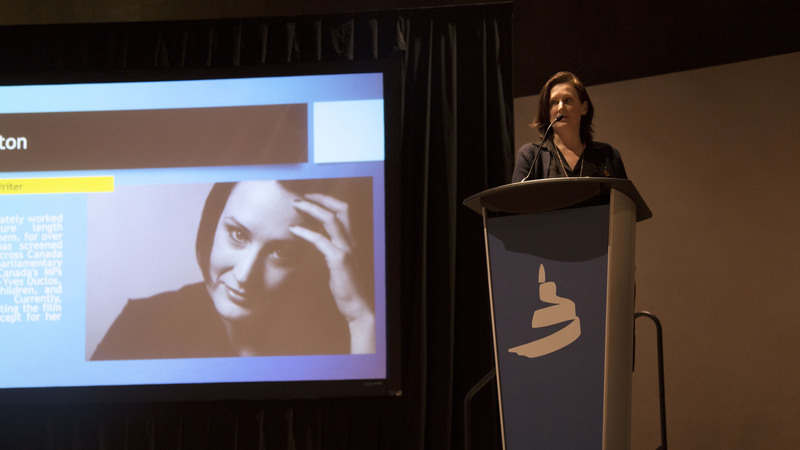 Kristy Loughton addresses the crowd prior to the screening of “Us and Them”. Fonatine, from Sagkeeng First Nation, had been reported missing numerous times before her body was discovered in the Red River in the summer of 2014. Law enforcement officials and Child and Family Services have been criticized for their handling of the matter. A jury acquitted Raymond Cormier of second-degree murder charges relating to Fontaine’s death Feb. 22. Mihychuk said even though reconciliation is a difficult task, the government is moving in the right direction and urged Winnipegers and urban Canadians to provide “culturally appropriate” safe spaces for families moving from First Nation communities to urban centres.